Stainless steel Hi Speed Magna Switch lane divider rated to 350 ft/min. Package parameters: up to 12" (W) x 4" to 12" (L) x up to 12" (H) and up to 25 lbs in weight. Equipped with a 50" W by 78" L lane. 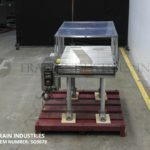 Has flexible design with heavy duty roller rods, adjustable centerlines, multiple lane patterns, 1 Hp drive motor, 36" conveyor height, on/switch, E-stop and mounted on adjustable height screw legs. Requires PLC. Intralox, Model ARB, Activated Roller Belt conveyor. Enables accurate and reliable merging and aligning of products. Equipped with (2) 16¾" wide x 60" long belts powered by a 1 hp drives. Activated rollers powered by a static plate. Parallel rollers embedded in the belt surface gently align products against 1½" high cleats set on 19½" centers. Belt cleating is offset on the two infeed conveyor sections to index boxes onto the merging conveyor. Merging conveyor equiped with (3) flat top belts. (2) 10" wide x 84" long outside belts pitched toward (1) 14" wide x 95" long center belt powered by (2) 1 hp drives. Cases are also turned 90° to align along the length of the package during the merge. Automatic, S/S, lane divider capable of speeds from 20 to 150 feet @ min (depending on application). Unit has a 60"L x 24"W lane table, adjustable centerlines, multiple lane patterns, product sensors, variable speed controls, and Lexan guarding. Mounted on a S/S frame with (4) legs and casters. 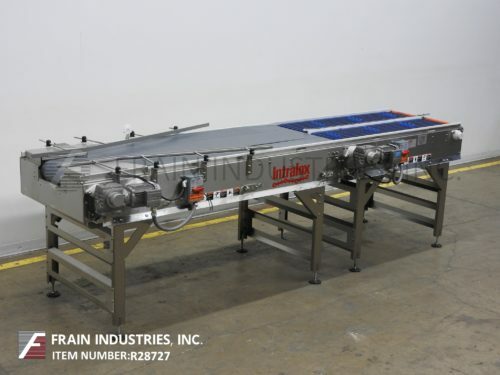 Stainless steel, 48" wide x 120" long, belt conveyor with servo controlled laner cylinders. 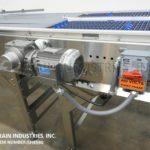 Equipped with a 48" wide x 120" long Neoprene style belt with a 31" to 36" infeed / discharge height powered by a 3 hp center drive and (2) Intelligent Actuator, model RCP2, diverting cylinders. Mounted on a (6) leg frame with leveling legs. Stainless steel, one to four lane, accumlation table. 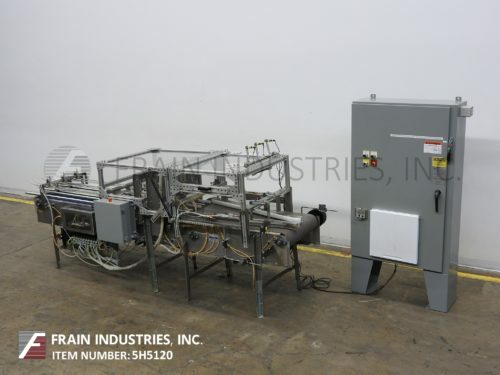 Equipped with (1) 23¾" wide x 94" long Intralox style belt, (1) 23¾" wide x 58" long Intralox style belt, (2) overhead pneumatic diverting stations with 8" max clearance [(1) one to two lane, (1) two to four lanes]. Adjustable width lane guides, pneumatic stop gate and back stop with (4) product eyes. Hi-Speed, Model 1.4 MFDA, automatic, magnetic flow, lane divider rated from 100 to 300 feet per minute number of packages – depending on materials, application and machine configuration. Automatically routes packages / product from a single lane to a four lane. 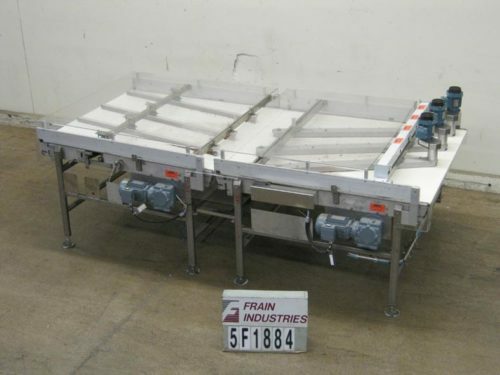 Equipped with 57" long x 34" wide divider bed, (2) sets of slider rods, electro magnetic system, powered roller rods with 1¼" long x 8" wide product carrier brackets which all help the product move side to side as they divide the product from 1 to 4 lanes with a 38½" in feed and discharge height. Control panel with variable speed and lexan safety guarding. 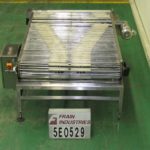 McBrady, 4 to 1lane conveyor, All stainless steel frame with delrin belts. Conveyor infeed height is 34" for (3) 7-1/2" wide belts; (2) 66" long and (1) 54" long. 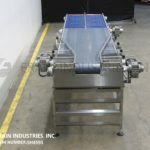 Discharge conveyor is 6" wide and 139" long with a height of 34". Powered by (2) ¾ Hp drive with variable speed AC controller on discharge.